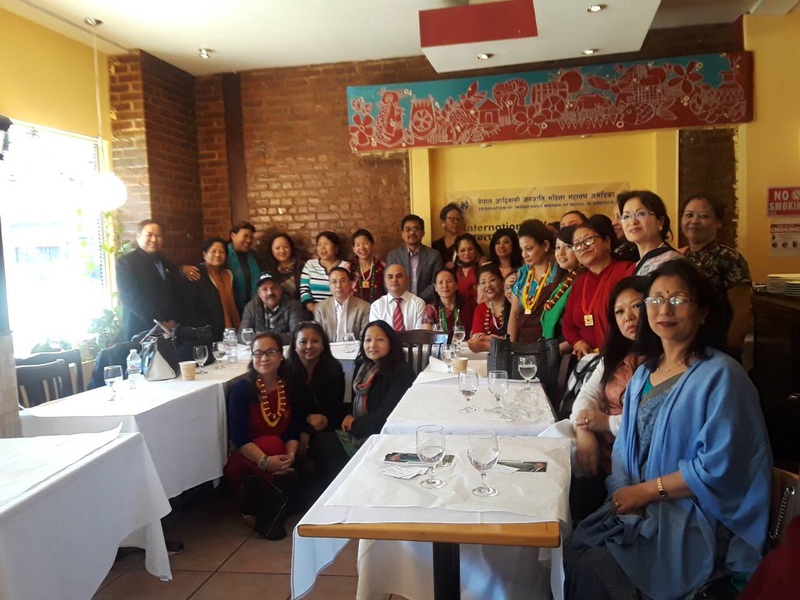 was to educate the indigenous women of Nepal in America and to enhance their understanding regarding the current immigration policy of the United State, tax policy and health insurance policy which are essential in everyday's life. Women are the foundation of every family and core human existence can't be imagined without their presence, but due to the double responsibility of taking care of their family along with the career development, it is very tough for them to be equal with the male counterparts. The disparity between the male and female is still existed because of the treatment of the women in different ways by their male counterparts. The event was held up with the effort of aspiring the women for the equal rights and justice to build the prosperous community where all the men and women feel equal despite belonging to a different gender. The focus went on the discussion on different topics which helped women to understand better about their basic required components while living in the foreign land. Equality doesn't come itself unless we practice in our own life. It is the matter that every single individual should understand and most importantly the male counterparts are the vital tools to apply the equality in the practical life. If a female understands what an equality and how to uplift oneself, but regardless of her understanding if she doesn't get support from her spouse and family that doesn't make any sense in her life. That is why we women have been educated, we are more talented and our understanding level is higher than those women who fought for the inequality and justice before a century ago but still it is not enough. We are here today, but the opportunity didn't come to us without the women's long battle and struggle to identify their rights and justice. FIWNA as an organization of women has been celebrating the international women's day every year since its beginning. This is the occasion to discuss our past progress and how we will uplift our future tomorrow. This year FIWNA decided to spread the education to the women who are far behind from having that information. The advocate Ramesh Shrestha, who has been practicing immigration law in the United State presented major issues of immigration law and current updates. The Pashupati Shrestha,CPA presented about the tax law, its benefits and provision in the United State and Harish Hamal who has been working as a health insurance agent for a long time in New York presented the provision and criteria about the health insurance policy and procedure. The Vice President Indira Chongbang expressed her tribute to the women who voiced for the women's rights and equality during her short welcome speech. The president Sangini Rana clarified why FIWNA held such a program during her thank you speech. The General secretary Bandana Rai and member Machchhe Gurung had conducted the program with the candlelight by the advisor former DIG of Nepal Parbati Thapa. The various community leaders Binod Pomo founder of FIPNA ( Federation of Indigenous People of Nepal in America), Luisang Waiba former president of FIPNA, Sundari Gurung president of FIPNA New Hampshire chapter , Chhatra Gurung advocate and member of the interim constitution of draft committee of Nepal, Bharati Rai, president of KRSA, J B Gurung from Gurung community, Rabi Kiran Koirala, president of Ridgewood Nepali community along with various representations from different communities of Nepal in New York participated in that event which gave a great sense of we and together we are stronger we will be, make this world beautiful.